17 years ago, Kim Possible premiered on Disney Channel as a cartoon. Now, however, we live in a world where all of our favorite OG cartoons get turned into live-action movies, and that’s exactly what’s happening with your favorite high schooler-turned-crime fighter Kim. That’s right, you guys! Disney Channel is giving us a live-action Kim Possible TV movie and we couldn’t be more ready. After nearly two decades without some of our fave characters, such as Ron Stoppable, Rufus and Wayne, the gang is finally back together to defeat Drakken and Shego for good. But first, J-14 is here to give you a behind-the-scenes look at the set. From Bueno Nacho to Kim’s bedroom, you get to see it all. 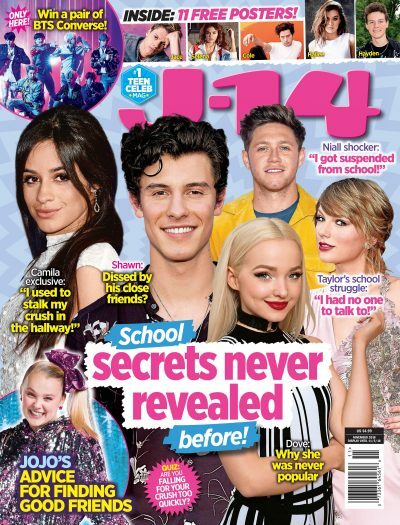 You can find this story and more in the March 2019 issue of J-14, on stands now! “This was such a fun day!” Erika Tham (Bonnie) tells J-14. “The girls who made up the soccer team in the movie were all so kind and fun — it felt like we were a real team. Also, you can’t tell in the movie, but it was freezing cold that day! I had about four heat packs hidden under my uniform!” Yikes!